MI6 are offering you a chance win paperback copies of the fourth Young James Bond novel "Hurricane Gold" plus exclusive Young Bond bookmarks! MI6 are offering you a chance win paperback copies of the fourth Young James Bond novel Hurricane Gold plus exclusive Young Bond bookmarks from Puffin! Win Copies of "Hurricane Gold" Paperback & Exclusive Young Bond Bookmarks! 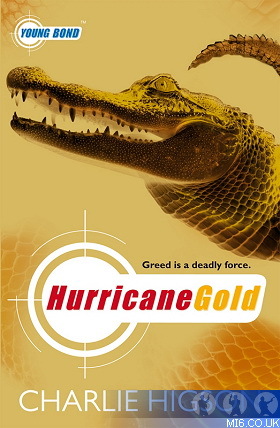 What is the name of the "Hurricane Gold" character inspired by an actor from the 1964 film "Goldfinger"? The competition closes at midnight GMT on 18th September 2008. MI6 will choose the winners at random from the correct answers received. The winners will be contacted via the email address supplied and their postal address will be requested. If a winner fails to respond within 7 days of prize notification, another winner will be chosen until all prizes are allotted. Competition is open to international MI6 readers.